^ Bills, Bruce G. (2005). “Free and forced obliquities of the Galilean satellites of Jupiter”. Icarus 175 (1): 233–247. Bibcode: 2005Icar..175..233B. doi:10.1016/j.icarus.2004.10.028. ^ a b McFadden, Lucy-Ann; Weissman, Paul; Johnson, Torrence (2007). The Encyclopedia of the Solar System. Elsevier. p. 432. ISBN 0-12-226805-9. ^ a b McGrath (2009). “Atmosphere of Europa”. Europa. University of Arizona Press. ISBN 0-8165-2844-6. ^ a b c d Jia, Xianzhe; Kivelson, Margaret G.; Khurana, Krishan K.; Kurth, William S. (2018-05-14). “Evidence of a plume on Europa from Galileo magnetic and plasma wave signatures”. Nature Astronomy. Bibcode: 2018NatAs...2..459J. doi:10.1038/s41550-018-0450-z. https://www.nature.com/articles/s41550-018-0450-z 2018年5月14日閲覧。. ^ a b Marazzini, Claudio (2005). 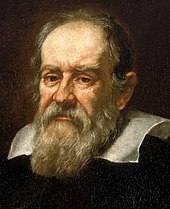 “I nomi dei satelliti di Giove: da Galileo a Simon Marius (The names of the satellites of Jupiter: from Galileo to Simon Marius)”. Lettere Italiane 57 (3): 391–407. ^ a b c Geissler, P. E.; Greenberg, R.; Hoppa, G.; Helfenstein, P.; McEwen, A.; Pappalardo, R.; Tufts, R.; Ockert-Bell, M. et al. (1998). “Evidence for non-synchronous rotation of Europa”. Nature 391 (6665): 368–70. Bibcode: 1998Natur.391..368G. doi:10.1038/34869. PMID 9450751. ^ a b Musotto, Susanna; Varadi, Ferenc; Moore, William; Schubert, Gerald (2002). “Numerical Simulations of the Orbits of the Galilean Satellites”. Icarus 159 (2): 500–504. Bibcode: 2002Icar..159..500M. doi:10.1006/icar.2002.6939. ^ Showman, Adam P.; Malhotra, Renu (1997). “Tidal Evolution into the Laplace Resonance and the Resurfacing of Ganymede”. Icarus 127 (1): 93–111. Bibcode: 1997Icar..127...93S. doi:10.1006/icar.1996.5669. http://www.lpl.arizona.edu/~showman/publications/showman-malhotra-1997.pdf. ^ Showalter, M. R.; Hamilton, D. P. (2015). “Resonant interactions and chaotic rotation of Pluto’s small moons”. Nature 522 (7554): 45–49. doi:10.1038/nature14469. ISSN 0028-0836. ^ a b c d Showman, Adam P.; Malhotra, Renu (1997). “Tidal Evolution into the Laplace Resonance and the Resurfacing of Ganymede” (PDF). Icarus 127 (1): 93–111. Bibcode: 1997Icar..127...93S. doi:10.1006/icar.1996.5669. http://www.lpl.arizona.edu/~showman/publications/showman-malhotra-1997.pdf. ^ Moore, W. B. (2003). “Tidal heating and convection in Io”. Journal of Geophysical Research 108 (E8): 5096. Bibcode: 2003JGRE..108.5096M. doi:10.1029/2002JE001943. 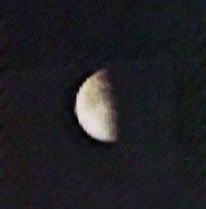 ISSN 0148-0227. http://adsabs.harvard.edu/full/1982MNRAS.201..415G 2008年1月2日閲覧。. ^ Kargel, Jeffrey S.; Kaye, Jonathan Z.; Head, James W., III; Marion, Giles M.; Sassen, Roger; Crowley, James K.; Ballesteros, Olga Prieto; Grant, Steven A. et al. (2000). “Europa's Crust and Ocean: Origin, Composition, and the Prospects for Life” (PDF). Icarus (Planetary Sciences Group, Brown University) 148 (1): 226–265. Bibcode: 2000Icar..148..226K. doi:10.1006/icar.2000.6471. http://www.planetary.brown.edu/pdfs/2440.pdf. ^ a b c d Greenberg, Richard (2005) Europa: The Ocean Moon: Search for an Alien Biosphere, Springer + Praxis Books, 978-3-540-27053-9. ^ a b Phillips, Cynthia B.; Pappalardo, Robert T. (2014-05-20). “Europa Clipper Mission Concept:”. Eos, Transactions American Geophysical Union 95 (20): 165–167. Bibcode: 2014EOSTr..95..165P. doi:10.1002/2014EO200002. ^ a b Kivelson, Margaret G.; Khurana, Krishan K.; Russell, Christopher T.; Volwerk, Martin; Walker, Raymond J.; Zimmer, Christophe (2000). “Galileo Magnetometer Measurements: A Stronger Case for a Subsurface Ocean at Europa”. Science 289 (5483): 1340–1343. Bibcode: 2000Sci...289.1340K. doi:10.1126/science.289.5483.1340. PMID 10958778. ^ Bhatia, G.K.; Sahijpal, S. (2017). “Thermal evolution of trans-Neptunian objects, icy satellites, and minor icy planets in the early solar system”. Meteoritics & Planetary Science 52: 2470–2490. Bibcode: 2017M&PS...52.2470B. doi:10.1111/maps.12952. http://onlinelibrary.wiley.com/doi/10.1111/maps.12952/epdf. ^ a b Hobley, Daniel E. J.; Moore, Jeffrey M.; Howard, Alan D.; Umurhan, Orkan M. (2018). “Formation of metre-scale bladed roughness on Europa’s surface by ablation of ice”. Nature Geoscience 11 (12): 901–904. doi:10.1038/s41561-018-0235-0. ISSN 1752-0894. ^ Schenk, Paul M.; Chapman, Clark R.; Zahnle, Kevin; and Moore, Jeffrey M. (2004) "Chapter 18: Ages and Interiors: the Cratering Record of the Galilean Satellites", pp. 427 ff. in Jupiter: The Planet, Satellites and Magnetosphere, Cambridge University Press, 0-521-81808-7. ^ Geissler, P. (1998). “Evolution of Lineaments on Europa: Clues from Galileo Multispectral Imaging Observations”. Icarus 135: 107–337. Bibcode: 1998Icar..135..107G. doi:10.1006/icar.1998.5980. ^ Figueredo, P. H.; Greeley, R. (2004). “Resurfacing history of Europa from pole-to-pole geological mapping”. Icarus 167 (2): 287. Bibcode: 2004Icar..167..287F. doi:10.1016/j.icarus.2003.09.016. ^ Hurford, T. A.; Sarid, A. R.; Greenberg, R. (2007). “Cycloidal cracks on Europa: Improved modeling and non-synchronous rotation implications”. Icarus 186: 218. Bibcode: 2007Icar..186..218H. doi:10.1016/j.icarus.2006.08.026. ^ Kattenhorn, Simon A. (2002). “Nonsynchronous Rotation Evidence and Fracture History in the Bright Plains Region, Europa”. Icarus 157 (2): 490–506. Bibcode: 2002Icar..157..490K. doi:10.1006/icar.2002.6825. ^ a b Schenk, Paul; McKinnon, William B. (1989). “Fault Offsets and Lateral plate motions on Europa: Evidence for a mobile ice shell”. Icarus 79 (1): 75–100. Bibcode: 1989Icar...79...75S. doi:10.1016/0019-1035(89)90109-7. ^ a b Kattenhorn, Simon; Prockter, Louise (2014). “Evidence for subduction in the ice shell of Europa”. Nature Geoscience 7 (9): 762. Bibcode: 2014NatGe...7..762K. doi:10.1038/ngeo2245. ^ Goodman, Jason C. (2004). “Hydrothermal plume dynamics on Europa: Implications for chaos formation”. Journal of Geophysical Research 109: E03008. Bibcode: 2004JGRE..109.3008G. doi:10.1029/2003JE002073. オリジナルの2012-03-08時点によるアーカイブ。. https://web.archive.org/web/20120308061644/http://www-paoc.mit.edu/paoc/papers/europa_plume.pdf. ^ O'Brien, David P.; Geissler, Paul; Greenberg, Richard (October 2000). “Tidal Heat in Europa: Ice Thickness and the Plausibility of Melt-Through”. Bulletin of the American Astronomical Society 30: 1066. Bibcode: 2000DPS....32.3802O. ^ Greenberg, Richard (2008). Unmasking Europa. Springer + Praxis Publishing. ISBN 978-0-387-09676-6. https://www.springer.com/astronomy/book/978-0-387-47936-1. ^ a b Schmidt, Britney; Blankenship, Don; Patterson, Wes; Schenk, Paul (24 November 2011). “Active formation of 'chaos terrain' over shallow subsurface water on Europa”. Nature 479 (7374): 502–505. Bibcode: 2011Natur.479..502S. doi:10.1038/nature10608. PMID 22089135. ^ Greeley, Ronald; et al. (2004) "Chapter 15: Geology of Europa", pp. 329 ff. in Jupiter: The Planet, Satellites and Magnetosphere, Cambridge University Press, 0-521-81808-7. ^ Park, Ryan S.; Bills, Bruce; Buffington, Brent B. (July 2015). “Improved detection of tides at Europa with radiometric and optical tracking during flybys”. Planetary and Space Science 112: 10–14. Bibcode: 2015P&SS..112...10P. doi:10.1016/j.pss.2015.04.005. ^ Nemiroff, R.; Bonnell, J., eds. (2012-05-24). "All the Water on Europa". Astronomy Picture of the Day. NASA. Retrieved 2016年3月8日. ^ Billings, Sandra E.; Kattenhorn, Simon A. (2005). “The great thickness debate: Ice shell thickness models for Europa and comparisons with estimates based on flexure at ridges”. Icarus 177 (2): 397–412. Bibcode: 2005Icar..177..397B. doi:10.1016/j.icarus.2005.03.013. ^ Zimmer, Christophe; Khurana, Krishan K.; Kivelson, Margaret G. (2000). “Subsurface Oceans on Europa and Callisto: Constraints from Galileo Magnetometer Observations” (PDF). Icarus 147 (2): 329–347. Bibcode: 2000Icar..147..329Z. doi:10.1006/icar.2000.6456. http://www.igpp.ucla.edu/people/mkivelson/Publications/ICRUS147329.pdf. ^ McCord, Thomas B.; Hansen, Gary B. (1998). “Salts on Europa's Surface Detected by Galileo's Near Infrared Mapping Spectrometer”. Science 280: 1242–1245. Bibcode: 1998Sci...280.1242M. doi:10.1126/science.280.5367.1242. http://www.sciencemag.org/cgi/content/abstract/280/5367/1242 2007年12月20日閲覧。. ^ Carlson, R. W.; Anderson, M. S.; Mehlman, R.; Johnson, R. E. (2005). “Distribution of hydrate on Europa: Further evidence for sulfuric acid hydrate”. Icarus 177 (2): 461. Bibcode: 2005Icar..177..461C. doi:10.1016/j.icarus.2005.03.026. ^ Calvin, Wendy M.; Clark, Roger N.; Brown, Robert H.; Spencer, John R. (1995). “Spectra of the ice Galilean satellites from 0.2 to 5 µm: A compilation, new observations, and a recent summary”. Journal of Geophysical Research 100 (E9): 19,041–19,048. Bibcode: 1995JGR...10019041C. doi:10.1029/94JE03349. ^ a b Borucki, Jerome G.; Khare, Bishun; Cruikshank, Dale P. (2002). “A new energy source for organic synthesis in Europa's surface ice”. Journal of Geophysical Research: Planets 107: 24-1–24-5. Bibcode: 2002JGRE..107.5114B. doi:10.1029/2002JE001841. ^ Trainer, MG (2013). “Atmospheric Prebiotic Chemistry and Organic Hazes”. Curr Org Chem 17: 1710–1723. doi:10.2174/13852728113179990078. PMC: 3796891. PMID 24143126. https://www.ncbi.nlm.nih.gov/pmc/articles/PMC3796891/. ^ Ruiz-Bermejo, M; Rivas, LA; Palacín, A; Menor-Salván, C; Osuna-Esteban, S (2011). “Prebiotic synthesis of protobiopolymers under alkaline ocean conditions”. Orig Life Evol Biosph 41: 331–45. Bibcode: 2011OLEB...41..331R. doi:10.1007/s11084-010-9232-z. PMID 21161385. ^ a b Tyler, Robert H. (11 December 2008). “Strong ocean tidal flow and heating on moons of the outer planets”. Nature 456 (7223): 770–772. Bibcode: 2008Natur.456..770T. doi:10.1038/nature07571. PMID 19079055. ^ “Europa: Energy”. NASA. (2012年). オリジナルの2016年4月28日時点によるアーカイブ。. https://web.archive.org/web/20160428191605/https://solarsystem.nasa.gov/europa/energy.cfm 2016年4月18日閲覧. "Tidal flexing of the ice shell could create slightly warmer pockets of ice that rise slowly upward to the surface, carrying material from the ocean below." ^ a b McCarthy, Christine; Cooper, Reid F. (2016-06-01). “Tidal dissipation in creeping ice and the thermal evolution of Europa”. Earth and Planetary Science Letters 443: 185–194. Bibcode: 2016E&PSL.443..185M. doi:10.1016/j.epsl.2016.03.006. ^ Pappalardo, Robert T.; McKinnon, William B.; Khurana, K. (2009). “Heat Transfer in Europa’s Icy Shell”. In Pappalardo, Robert T.; McKinnon, William B.; Khurana, K.. Europa. The University of Arizona Press. p. 405. ISBN 9780816528448. ^ Lowell, Robert P.; DuBosse, Myesha (2005-03-09). 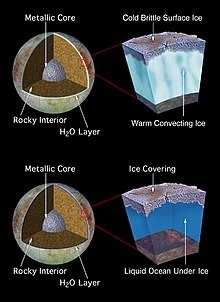 “Hydrothermal systems on Europa”. Geophysical Research Letters 32 (5). Bibcode: 2005GeoRL..32.5202L. doi:10.1029/2005GL022375. ^ Ruiz, Javier (2005). “The heat flow of Europa” (PDF). Icarus 177 (2): 438–446. doi:10.1016/j.icarus.2005.03.021. ISSN 00191035. http://eprints.ucm.es/10490/1/15-Europa_5.pdf. ^ a b Roth, L.; Saur, J.; Retherford, K. D.; Strobel, D. F.; Feldman, P. D.; McGrath, M. A.; Nimmo, F. (2013-11-26). “Transient Water Vapor at Europa's South Pole” (pdf). Science 343 (6167): 171–174. Bibcode: 2014Sci...343..171R. doi:10.1126/science.1247051. PMID 24336567. http://spacetelescope.org/static/archives/releases/science_papers/heic1322a.pdf 2014年1月26日閲覧。. ^ Hansen, C. J.; Esposito, L.; Stewart, A. I.; Colwell, J.; Hendrix, A.; Pryor, W.; Shemansky, D.; West, R. (10 March 2006). “Enceladus' Water Vapor Plume”. Science 311 (5766): 1422–1425. Bibcode: 2006Sci...311.1422H. doi:10.1126/science.1121254. PMID 16527971. ^ Spencer, J. R.; Nimmo, F. (2013-05). “Enceladus: An Active Ice World in the Saturn System”. Annual Review of Earth and Planetary Sciences 41: 693. Bibcode: 2013AREPS..41..693S. doi:10.1146/annurev-earth-050212-124025. ^ Huybrighs, Hans; Futaana, Yoshifumi; Barabash, Stas; Wieser, Martin; Wurz, Peter; Krupp, Norbert; Glassmeier, Karl-Heinz; Vermeersen, Bert (2017-06). “On the in-situ detectability of Europa's water vapour plumes from a flyby mission”. Icarus 289: 270–280. arXiv:1704.00912. Bibcode: 2017Icar..289..270H. doi:10.1016/j.icarus.2016.10.026. ^ Hall, D. T.; Strobel, D. F.; Feldman, P. D.; McGrath, M. A.; Weaver, H. A. (1995). “Detection of an oxygen atmosphere on Jupiter's moon Europa”. Nature 373 (6516): 677–681. Bibcode: 1995Natur.373..677H. doi:10.1038/373677a0. PMID 7854447. ^ Kliore, Arvydas J.; Hinson, D. P.; Flasar, F. Michael; Nagy, Andrew F.; Cravens, Thomas E. (July 1997). “The Ionosphere of Europa from Galileo Radio Occultations”. Science 277 (5324): 355–358. Bibcode: 1997Sci...277..355K. doi:10.1126/science.277.5324.355. PMID 9219689. ^ Johnson, Robert E.; Lanzerotti, Louis J.; Brown, Walter L. (1982). “Planetary applications of ion induced erosion of condensed-gas frosts”. Nuclear Instruments and Methods in Physics Research 198: 147. Bibcode: 1982NucIM.198..147J. doi:10.1016/0167-5087(82)90066-7. ^ Shematovich, Valery I.; Cooper, John F.; Johnson, Robert E. (April 2003). “Surface-bounded oxygen atmosphere of Europa”. EGS – AGU – EUG Joint Assembly (Abstracts from the meeting held in Nice, France): 13094. Bibcode: 2003EAEJA....13094S. ^ Liang, Mao-Chang; Lane, Benjamin F.; Pappalardo, Robert T.; Allen, Mark; Yung, Yuk L. (2005). “Atmosphere of Callisto” (PDF). Journal of Geophysical Research 110 (E2): E02003. Bibcode: 2005JGRE..11002003L. doi:10.1029/2004JE002322. オリジナルの2009-02-25時点によるアーカイブ。. https://web.archive.org/web/20090225131107/http://yly-mac.gps.caltech.edu/ReprintsYLY/N164Liang_Callisto%2005/Liang_callisto_05.pdf. ^ Chyba, C. F.; Hand, K. P. (2001). “PLANETARY SCIENCE: Enhanced: Life Without Photosynthesis”. Science 292 (5524): 2026–2027. doi:10.1126/science.1060081. PMID 11408649. ^ a b Hand, Kevin P.; Carlson, Robert W.; Chyba, Christopher F. (2007-12). “Energy, Chemical Disequilibrium, and Geological Constraints on Europa”. Astrobiology 7 (6): 1006–1022. Bibcode: 2007AsBio...7.1006H. doi:10.1089/ast.2007.0156. PMID 18163875. ^ a b Smyth, William H.; Marconi, Max L. (2006). Europa's atmosphere, gas tori, and magnetospheric implications. 181. p. 510. Bibcode: 2006Icar..181..510S. doi:10.1016/j.icarus.2005.10.019. ^ a b McKay, C.P. (2002). “Planetary protection for a Europa surface sample return: The Ice Clipper mission”. Advances in Space Research 30 (6): 1601–1605. Bibcode: 2002AdSpR..30.1601M. doi:10.1016/S0273-1177(02)00480-5. ^ Abelson & Shirley – Small RPS-Enabled Europa Lander Mission (2005) Archived 8 October 2011 at the Wayback Machine.. (PDF). Retrieved on 23 July 2013. ^ Weiss, P.; Yung, K. L.; Kömle, N.; Ko, S. M.; Kaufmann, E.; Kargl, G. (2011). “Thermal drill sampling system onboard high-velocity impactors for exploring the subsurface of Europa”. Advances in Space Research 48 (4): 743. Bibcode: 2011AdSpR..48..743W. doi:10.1016/j.asr.2010.01.015. ^ Preventing the Forward Contamination of Europa. Washington (DC): National Academy Press. (2000). ISBN 0-309-57554-0. オリジナルの13 February 2008時点によるアーカイブ。. http://www7.nationalacademies.org/ssb/europamenu.html. ^ Powell, Jesse; Powell, James; Maise, George; Paniagua, John (2005). “NEMO: A mission to search for and return to Earth possible life forms on Europa”. Acta Astronautica 57 (2–8): 579–593. Bibcode: 2005AcAau..57..579P. doi:10.1016/j.actaastro.2005.04.003. ^ a b Marion, Giles M.; Fritsen, Christian H.; Eicken, Hajo; Payne, Meredith C. (2003). “The Search for Life on Europa: Limiting Environmental Factors, Potential Habitats, and Earth Analogues”. Astrobiology 3 (4): 785–811. Bibcode: 2003AsBio...3..785M. doi:10.1089/153110703322736105. PMID 14987483. ^ Richard Greenberg (2010-05). “Transport Rates of Radiolytic Substances into Europa's Ocean: Implications for the Potential Origin and Maintenance of Life”. Astrobiology 10 (3): 275–283. Bibcode: 2010AsBio..10..275G. doi:10.1089/ast.2009.0386.